Grab some snacks and get comfortable 'cause boy do we have one heck of game day write-up! Our Wildcats traveled to High Mowing School, who had four inches of rain the night before. The field may have been a difficult obstacle for the girls, having to manage the ball smarter and keep moving through the wet grass. However we were up for the challenge! With a fiery start, KUA controlled the ball well, but went scoreless in the first first quarter of the game. High Mowing scored early, but the girls held them tight to the one goal. Junior Winsome Neville got stuck in a puddle with the ball, but perservered and managed to clear it out. With many more plays similar to this, Junior Maddy Haynes was finally able to push through, past an aggressive goalie, and add one to the board making the score 1-1. Sophomore Ellie Stedina and Freshman Helena Heckmen made epic saves in the mud to keep the energy up for KUA. By the second half, KUA came back better than ever. From an awesome cross by Freshman Lily Wennik, Junior Molly Beaupre shot one in, putting KUA up by 1. The defense held the ball in front of them, even with the slippery conditions, and goalies Freshman Indigo Kopp and Sophomore Jenna Santos made two saves each to secure the win. Freshman Briana Angelli put her best foot forward, literally and metaphorically, with two huge kicks up the field to help out the forwards. Soon after, Sophomore Ellie Stedina scored her first KUA goal on a breakaway. With mud everywhere and the intensity high, the Wildcats put one more ball in the back of the net, shot by Junior Maddy Haynes from a beautfiul cross from Sophomore Ellie Stedina. 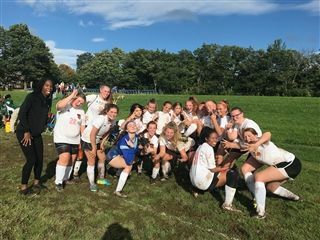 This will be a game the girls will surely never forget, as we ride back covered in mud, ready to take on Proctor Academy on Friday, September 28th.